Danny Green (pno); Justin Grinnell (bs); Julien Cantelm (dms) + (on 3 tracks) Antoine Silverman, Max Moston (vln); Chris Cardona (vla); Anja Wood (cello). 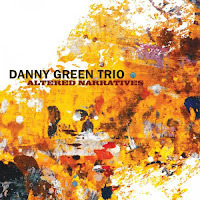 It's always a delight to discover a new talent although, as I've reviewed a previous album by Danny Green, perhaps new isn't quite the right word. In my defence, that was back in 2012 and you know what us reviewers of a certain age are like for remembering! Well, I was knocked out by that album and this one doesn't hurt either! In a bygone age, the Danny Green Trio would be rated alongside Oscar Peterson and all the others downwards. With Oscar long gone, it's trios, such as this. that keep the flag flying for piano jazz. I'd love to have heard him on Marian McPartland's legendary radio show. The three tracks with the string quartet are as fine an example get of 'Chamber Jazz' as you are likely to find on a long night's listening. They're quite beautiful and not at all schmaltzy. Green, who resides in San Diego, believes that music should tell a story and the titles give the listener much inspiration to bring their own take on those stories although mine disagreed with Danny's! But that's the beauty of music - the picture it creates. Chatter From All Sides: The Merge; October Ballad; 6 A.M. Second Chance; Katabasis; Porcupine Dreams; Benji's Song; I Used to Hate the Blues; Friday at the Thursday Club; Serious Fun. All About Jazz says, "One of the important up-and-comers on the scene today" - can't argue!